At our practice, our priority is to deliver quality dermatological care to informed patients in a comfortable and convenient setting. When you have needs for dermatological care, you need to turn to a doctor who listens and responds...an experienced doctor who knows the field and can effectively diagnose and treat your needs...a friendly physician who counsels you on the best ways to maintain and improve your skin health. Our practice is here for you. Plus, you will benefit from our dedicated staff who give you the attention that you need. We believe that informed patients are better prepared to make decisions regarding their health and well being. That's why we've included information on this website covering topics associated with dermatology. We strive to make our office as efficient and convenient as possible. Included in these web pages is information about our location including maps, directions to our office, hours, insurance policies and appointment scheduling. We hope you find this website useful and invite you to contact us with additional questions at 949-733-1336. 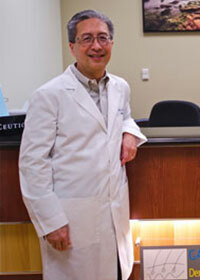 Dr. Gary Lee is certified by the American Board of dermatology. Our practice offers general, surgical, and cosmetic dermatological services. We accept most major insurance plans, Medicare and cash payments.